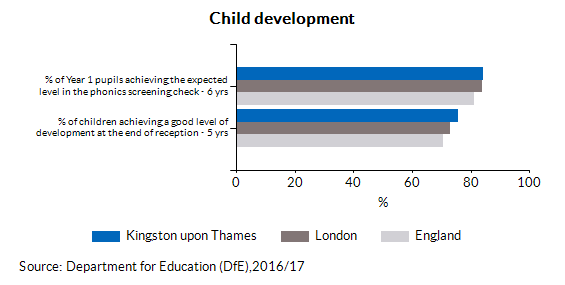 Improving the level of education and skills present within a local population remains an important policy objective for both local and central government. 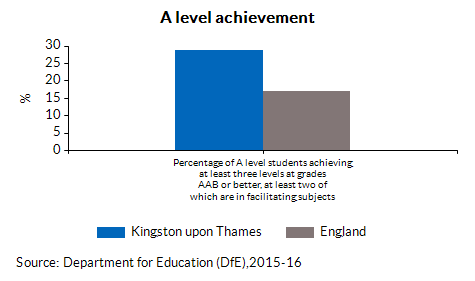 The task of implementing initiatives to improve life-long learning and enhance individual development (and employability) represents a significant and essential challenge for local authorities. 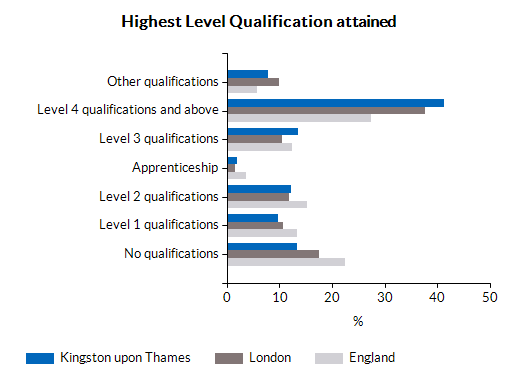 This section shows educational qualifications for Kingston upon Thames. Other qualifications: Vocational/Work-related Qualifications, Foreign Qualifications (not stated/level unknown). 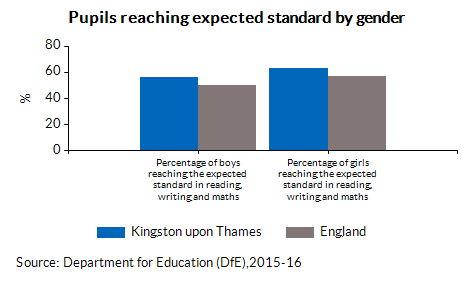 Children are defined as having reached a good level of development if they achieve at least the expected level in the early learning goals in the prime areas of learning (personal, social and emotional development; physical development; and communication and language) and the early learning goals in the specific areas of mathematics and literacy. 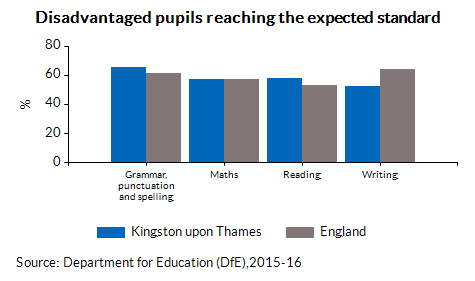 Pupils are deemed to have met the required standard of phonic decoding if they scored 32 or more out of a possible 40 in the test. 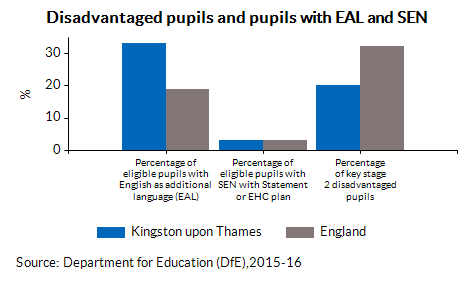 Key stage 2 refers to Year 3 to Year 6 and to pupils aged between 7 and 11. In year 6 there are national tests and teacher assessments in English and maths, and teacher assessments in science. 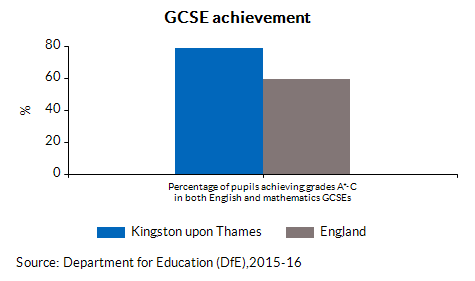 Key stage 4 refers to Year 10 and Year 11, when pupils are aged between 14 and 16. 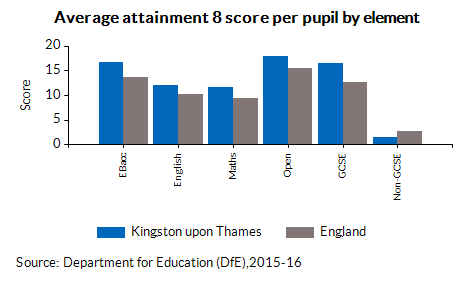 Most children take GCSEs or other national qualifications in Year 11. 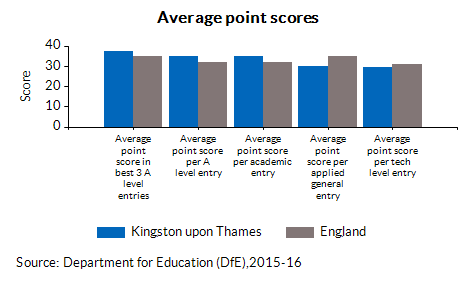 Key stage 5 refers to the two years of education for students aged 16-18 sitting AS and A levels. 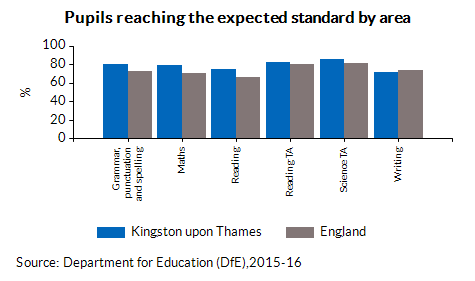 The Indices of Deprivation 2015 provide a set of relative measures of deprivation for small areas (Lower-layer Super Output Areas) across England. The IDACI is a subset of the Income Deprivation Domain, with the Index showing the proportion of children aged 0 - 15 in each Lower-layer Super Output Area that live in families that are income deprived (those that are in receipt of Income Support, income-based Jobseeker’s Allowance, Pension Credit Guarantee or Child Tax Credit below a given threshold). 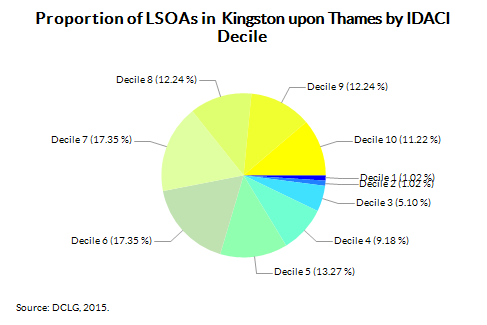 The pie chart shows the proportion of lsoa's in Kingston upon Thames in each decile with decile 1 being the most deprived 10% of areas in England.